Revised With More Great Exercises! 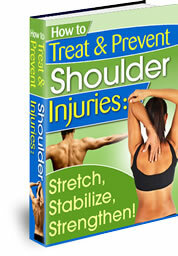 Newly Revised Shoulder Ebook 2nd Edition with more great stretches and strengthening exercises to help you heal faster. Also, anatomy charts so you know exactly what and where to focus on the muscles and joints you want to work. I wrote this shoulder ebook to help improve the lives of countless people who are suffering from shoulder pain and injury. Now you can have it too! You may feel frustrated because of the long-term pain you have been experiencing in your shoulders due to frozen shoulder, impingement, rotator cuff tears, etc. and, how you can prevent it from happening again. I have experienced this frustration first hand through countless numbers of my own clients who experienced rotator cuff tears, impingements, thoracic outlet syndrome, and just muscle weakness. I’ve spent the past several months rehabilitating my own shoulder after a broken collarbone left the muscles tight and atrophied leading to shoulder myalgia or muscle pain.
" I used to be an avid tennis player, but for the past 10 years I have quit playing because of the pain in my shoulder. Since I started doing these Pilates-based stretching and stabilizing exercises my shoulder pain is gone and I am playing tennis again at 65 years of age!" "Incorporating Pilates-based fundamentals into my regular strength training workouts has greatly improved my form and technique. It makes me more aware of how I move and breathe, helping me to protect my shoulders by using my muscles in the correct way." "Through Pilates and many of these specific shoulder ebook exercises I have increased my posture and upper body strength through the shoulder stretching and stabilizing exercises. This has decreased the shoulder pain that I have felt for years when doing day to day activities like cooking and cleaning the house." More and more people like yourself are coming to learn that surgery is not always the best solution for shoulder pain. More often than not the issue can be addressed with proper stretching and shoulder strengthening exercises. Even if you do go through surgery the pre and post rehab of the shoulder muscles using this exercise system will bring you back to normal functioning more quickly and with less chance of re-injury. 1. The anatomy of the shoulder girdle complex and why it is so susceptible to injury. 2. Common shoulder injuries or conditions that develop from overuse, under-use, and traumatic injury to the shoulder girdle. 3. Pictures and detailed descriptions of how to first gain range of motion back in the shoulder after injury, then exercises to stabilize and strengthen the shoulder girdle, and then finally how to strengthen the muscles that surround and protect the fragile shoulder complex. Leave Shoulder Ebook and find more ways Pilates Exercises can benefit you and your shoulder by going here. Then you will learn to stabilize the muscles that support the shoulder, and finally strengthen the all-important muscles of the shoulder including the rotator cuff muscles. This exercises in this shoulder ebook, if followed in the order of progression: Stretch, Stabilize, Strengthen will take you from pain and atrophy to a healthy functioning shoulder so you can enjoy life again! My name is Jennifer Adolfs and I am the founder of this website Pilates-Back-Joint-Exercise.com and I believe that a well functioning body is made up of a healthy spine and joints. My goal is to help individuals, like yourself who are looking for solutions to back and joint pain to help themselves through corrective exercises. I have been specializing in working with people who have musculoskeletal conditions for over 12 years. In the past 7 years since using Pilates and the techniques described in this shoulder ebook specifically for shoulders I have witnessed amazing results from people like yourself in shoulder strength and normal functional use. The exercises and concepts used in this shoulder ebook are Pilates – based, which doesn’t mean you need a special machine or piece of equipment to do them. It takes into account the fact that you may just be doing them in your own home and can use whatever is available to you. I have utilized stretch bands or tubes and small dumbbells for your convenience. These exercises are described and shown for your own personal use at home or wherever you want to exercise. and finally stabilizing the joint and mobilizing the limb with fluid and efficient movement. Using proper exercise form and learning to stabilize the shoulder girdle or scapula before beginning each shoulder exercise will help you to move more efficiently and with less chance of injury. If you try these exercises for 4 weeks and you don't feel any better let me know and I will refund your money. After reviewing the ebook if you find that you have some questions regarding any of the exercises please contact me via the form on the website and I would be happy to coach you through some of the challenges you are facing. 1. Stretching exercises specific to the shoulder. 2. Stabilizing exercises that are Pilates-based so you strengthen the deeper core muscles of the shoulder girdle. 3. 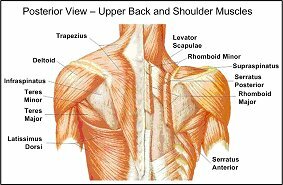 Strengthening exercises specific to the rotator cuff, deltoids, and the muscles of the upper and middle back that stabilize the scapula (shoulder blades). The strength exercises utilize dumbells and stretch bands for resistance when you are ready. 5. Detailed Descriptions of why you are doing the exercises, how to do the exercises correctly, and tips to keep proper form. 6. Free coaching and advice through the contact form on website! All of this for the low price of just $20!!! Compared to the $60-$75/ hour cost of working with a fitness professional to find out this same information you are getting it all printed out for you. My hope for you is that this shoulder ebook will add more value to your life than you could ever pay me in cash value.